Yes. The AudioBox USB is a class compliant device and does not need any device drivers. It uses the class driver from Apple. If you're having problems with PT12, then there is a configuration issue with PT12 itself. Please contact Avid technical support for assistance. Can Protools software be used with Studio 192 rack audio interface? What kind of files can be imported and be used with the device? 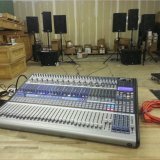 Can Presonus RM32AI be used as stage box for Midas M32 board?